Ok children, the DragonWing guitar from William Jeffrey Jones Guitars is finished. 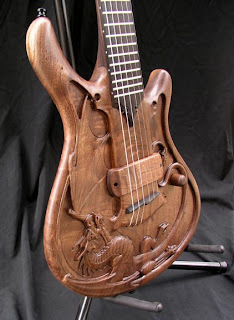 I must say that it's one of the most insane guitars I have ever seen. Look at how the ornamentation compliments both the lines of the guitar and the grain of the wood. That is the eye of an artist at work. 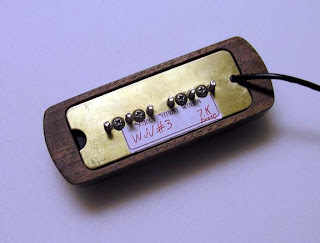 I talked to Jeffrey on the phone several times while we were developing the pickup for this guitar and was struck by the realization that this man is truly an artist in the most classic sense of the word. Although his sculpting medium has changed from time to time he is a guy who has made his living as a sculptor for most of his life. There is a very good chance you have seen his work. Jeffrey has been building guitars for a long time. First as a hobby and a bit of an escape from his sculpting work. Then as demand for his fantastic instruments grew the guitars became a second passion. The DragonWing represents a coming together of the passions of William Jeffrey Jones. The artist and the craftsman that reside in his soul have come together into unbelievable works of art that are as grand to play and hear as they are fantastic to look at and feel. The pickup for this guitar is a mellow sounding humbucking P-90 . This is a design I make exclusively for WJJ Guitars . I didn't make the cover. Come on... you have seen the guys carving ability. Does he need for me to carve a cover for him?